Inshore water temperatures on the North End of the Grand Strand are in the lower 80s, and water clarity is poor after the rain the past few days. 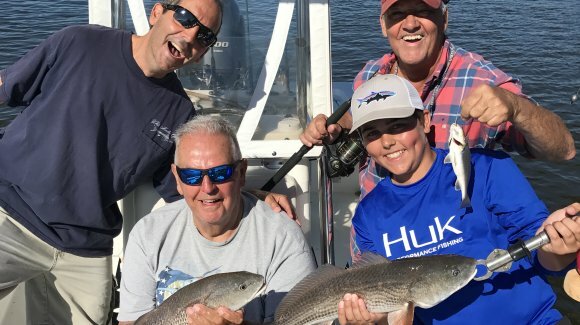 Despite less than ideal weather, Captain Patrick “Smiley” Kelly reports that the fishing has been pretty steady – especially on the outgoing tide. 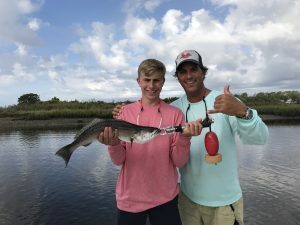 His boat has been catching redfish and black drum in the IntraCoastal Waterway around Tubbs Inlet, mainly fishing with live shrimp or finger mullet on a Carolina rig. They are fishing on the bottom in about 15 feet of water in the middle of the ICW. This is a pretty typical August pattern. There is still a pretty good bite for trout first thing on topwater lures, and they are also catching fish on live shrimp fished underneath a popping cork. Tubbs Inlet, Little River Inlet, and the Calabash River have all been productive. On high water fishing around the grass is the best bet, and on lower tides fishing around oyster beds or drop-offs in the channel is most productive. The best bite of the day is early in lower light conditions before it gets hot. Flounder have been caught on finger mullet in small drains off the main waterways, along with some redfish and topwater trout. Fishing finger mullet on the outgoing tide has been the best pattern.